An essential reference for nature lovers and bird watchers; or an accompanying text for anyone studying zoology or ornithology. This book makes a identifying birds easy for anyone who is relatively new to the subject. The trick about identifying any sort of animal or plant is to get to know the broad groups first; so as to have a foundation in the subject. After that, identifying the different species within that broad group will become so much easier. For example: you first need to be able to distinguish between birds of prey and other birds, then identifying different types of birds of prey will become so much easier. Similarly, you need to understand the difference between seabirds and divers, before you start to learn the differences between different types of seabirds (or divers). Come and enjoy a captivating compilation of birdlife, their behaviour and how these fascinating creatures adapt to the world. This book includes an assortment of factual information, exhilarating illustrations and a gathering of interesting facts that will appeal to bird enthusiasts at all levels of talent. This is a unique opportunity to develop that solid foundation; that will allow you to build your knowledge and become an expert in ornithology. This book is intended as a great start for those studying birds or amateur bird watchers. 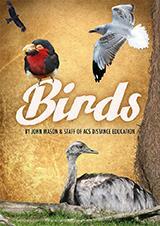 'Birds' is a complementary text for anyone studying the Ornithology (BEN102) course, with ACS Distance Education. This is the largest chapter in the book. It systematically presents each of the 29 main orders that birds belong to, and provides illustrations and descriptions of each order, in turn.